The Brand Gap is considered a standard on bridging strategy and design, and this second edition of the book features a 220-term brand glossary and a premium softcover binding. 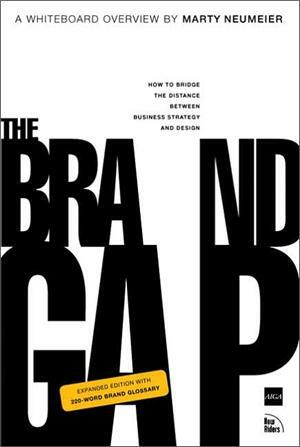 The Brand Gap is the first book to present a unified theory of brand-building. Whereas most books on branding are weighted toward either a strategic or creative approach, The Brand Gap shows how both ways of thinking can unite to produce a "charismatic brand" — a brand that customers feel is essential to their lives. This second edition of The Brand Gap features a 220-term brand glossary and a premium softcover binding. Not since Canadian educator, philosopher, and scholar Marshall McLuhan's The Medium Is The Message has a book compressed so many ideas into so few pages. Using the visual language of the boardroom, Marty Neumeier presents the first unified theory of branding — a set of five disciplines to help companies bridge the gap between brand strategy and customer experience. Those with a grasp of branding will be inspired by the new perspectives they find here, and those who would like to understand it better will suddenly "get it." The Brand Gap is a deceptively simple book that offers everyone in the company access to "the most powerful business tool since the spreadsheet." Marty Neumeier is president of Neutron LLC, a San Francisco-based firm specializing in brand collaboration. Before launching Neutron in 2002, he was editor and publisher of Critique, the "magazine of graphic design thinking", which had quickly become the leading forum for improving design effectiveness.